Cleopatra, one of the most famous figures of ancient history, was the last ruler of EGYPT in the tradition of the pharaohs who had governed the land for several thousand years. She came to the throne in 51 B.C. as the wife of her brother, Ptolemy XIII. For several hundred years before that time, Rome had been increasing its control over Egypt. The young Cleopatra needed an ally in a struggle with enemies in Egypt. According to legend, she had herself rolled in a carpet and delivered as a gift to the powerful Roman general Julius Caesar. With Roman support, Cleopatra defeated Ptolemy and ruled as pharaoh. She also began a love affair with Caesar. Caesar built a palace in Rome for Cleopatra and their son, Caesarion. After Caesar was assassinated in 44 B.C., Cleopatra allied herself with Mark Antony, another leading Roman. Antony hoped that the riches of Egypt would help him become ruler of Rome. Cleopatra bore Antony three children. She hoped that he would make her children his heirs and Rome’s future rulers. In 32 B.C. Octavian, Antony’s great rival in the Roman government, declared war against Antony and Cleopatra. The two lovers lost their navy in a battle near Greece and retreated to ALEXANDRIA, where both committed suicide. 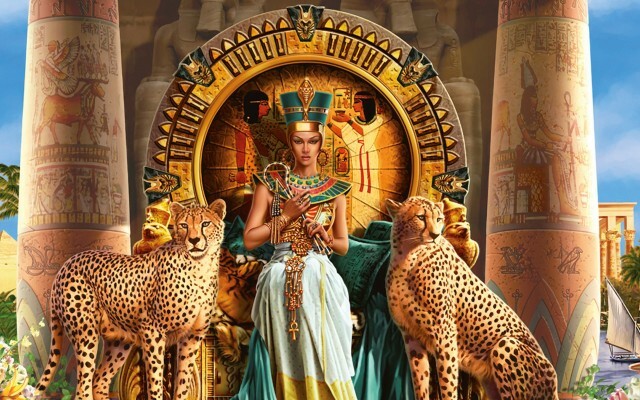 Although she lost her life and her kingdom, Cleopatra is remembered in history as an intelligent, ambitious, and passionate ruler.